The Billionty-Oneth Geek: Darth Vader Toaster!!!!!!!!!!!! Ain't It Cool News posted their annual Christmas shopping guide, for things of all geekeries with my favourite this year being the Star Wars Darth Vader Toaster. 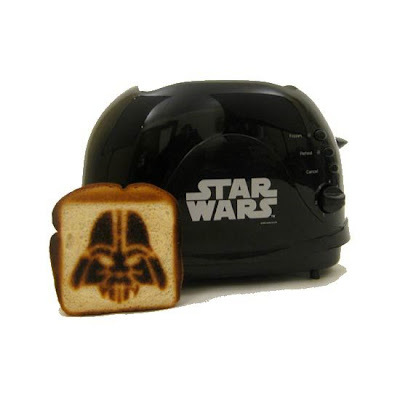 There's not too much to explain, it burns a Darth Vader face onto your toast. I will buy this one day, oh yes I will. You can order one from the official Star Wars website found here. Later geeks. I once painted an old garbage can to resemble an old and battered R2-D2, but this Vader toaster is truly badass! I love it! I'm coming over for some dark side toast. Sweet! 10% chance of Force choke... by the toast or by cancer :). Pretty rad eh? They need to make a Yoda one to balance the Dark side with some Jedi force. Kly has a blogger account! Could a blog be that far off?!?!? I would love one that toasted the Enterprise!!! LOL Ally, you're too much of a Trekkie/er. Wow I am stunned by how much I want a Darth Vader Toaster!! !